Hi everyone. Happy Wednesday. Happy almost end of May. Wow, I can't believe how fast this month flew by. I say that every month so you'd think I wouldn't be so surprised how fast time flies every month. But it s always seem like the months zip right by. This month Jo has hosted a great challenge over at Art Journal Journey The theme was flora and fauna, and I really enjoyed participating. Thanks Jo for such a great theme. This is my last page for this challenge. It's from my Japan journal and centered around a photo I found in a free travel magazine that I brought back with me. It reminded me of a moment on the trip when we visited the principal's (of our sister school) garden. Here's the full spread. The card on the right is Principal Fujiwara's business card. Trading business cards in Japan is a big thing, and my school had to make some for each of us so we could participate in that custom. You can see I layered some origami paper and some bits from a JApanese book to make my background. I used a vintage TH frame that I had around the magazine photo, and also added some little plastic flowers that I think came off of some cupcakes or a cake a long time ago. Here's a few other photos from our garden visit. 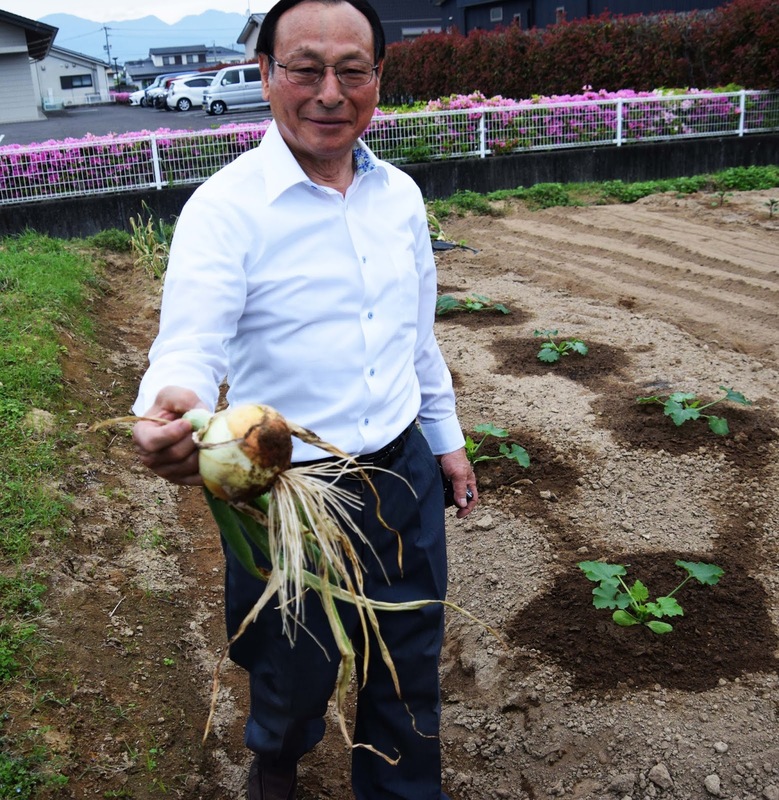 Principal Fujiwara has both a huge vegetable garden and some beautiful flower beds too. And he even had some tangerine trees laden with fruit. And I want to send a shout to Jeanie at the The Marmelade Gypsy for a book recommendation. I just finished reading this book she wrote about in her post. It's a fabulous story about a family, history and art. I'm with you Jeanie. It was a fantastic read that took me to Paris at the turn of the 20th century, Vienna up though 1940 and a few other spots including Japan. I enjoyed a bit of armchair traveling! I appreciate your stopping by and visiting. Your page looks very Japanese and the pink floral background looks like the pink flowers in the principal's garden. A friend who worked for a company who did business with Japan, told me the business card exchange was a big deal. There was even a proper way to present the business card. Good that your school had business cards made for you. The principal looks like he packed a lot into a small space. He obviously has a green thumb. Enjoy the sunshine. I'm so glad you liked the book, Erika! 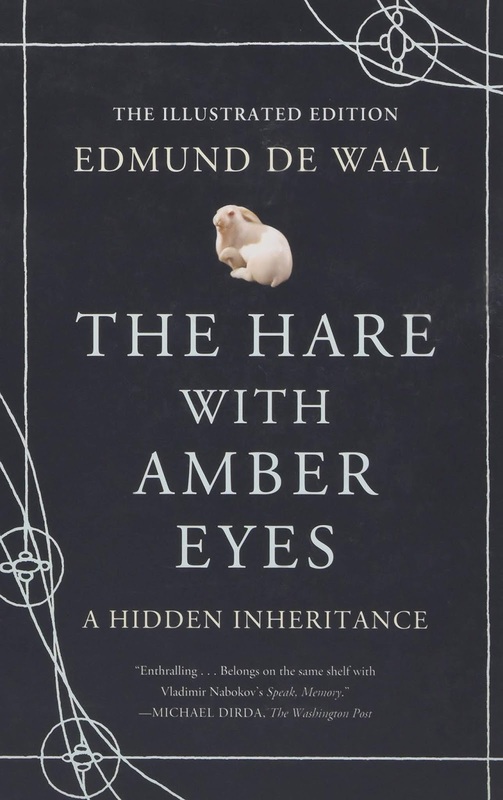 I found it intriguing but not everyone in my book club did, so I'm glad it was a hit! Did you find that in your school you visited the kids did the cleaning? Years ago, when Rick went, the kids did all the cleaning in the classroom at the end of the day -- mopping and sweeping, etc. I love the garden idea. What a great experience you had. Your pages are so beautiful Erika! I love how you took this free travel magazine photo for creating this fabulous pages to remember the visit at the fantastic garden of the school principal. So lovely arranged all the different meaningful pieces, so well put together all to create that interesting composition.And wow - even tangerine trees laden with fruit. Isn't this wonderful???!!! Yes time flies - and that's life I think! You supported Jo's theme in a fantastic way this month! You are such a supportive AJJ artist! Thank you very much my friend! I love your Japan postings! The book sounds extremly interesting. 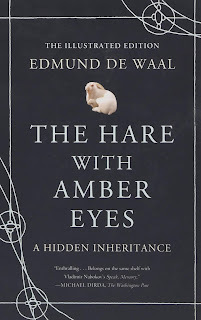 I found some stunning details about the author and potter De Wal on YT now as I got curious. I put it on my reading list for sure! Thanks for the reference Erika! Nice weather here as well - very hot and some thunder-storms in the area already, but we had hardly any bad rain or thunderstorm yet. Hope it stays that way the whole week and weekend! It is another wonderful page Erika. The black letters look japanese at first sight and I like your page so much! This is a wonderful art page Erika !! Lovely design, with the so beautiful origami paper, the plastic flowers and the gorgeous frame and photo!! Thank you very much for sharing the fantastique photos with us, they are all interesting, flowers and plants are great!! Great that you made a Japanese Journal page for the AJJ theme. How interesting that they trade business cards; this one looks so much more interesting with the Japanese characters. 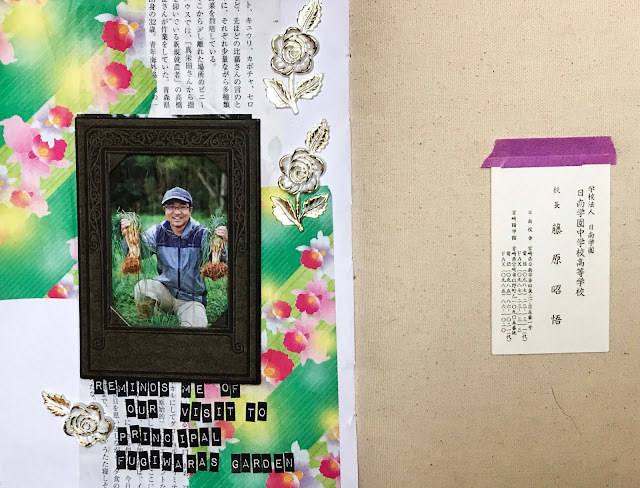 By using the origami paper and the little silver flowers, plus the photograph, you've created such an unusual page. I was really interested in the garden photos. The garden looks so neat and orderly and productive. Oh and meant to say thanks for the book recommendation. This book looks really fascinating. A fantastic memory page, the origami papers you used looked lovely and framing the main picture really draws me in to the page. It must have been wonderful visiting the School Principle's garden, the flowers and trees looked so pretty and he did seem to have a super vegetable garden as well. I adore this journal page, Erika. It is both clever and artsy. I love how you adapted the washi paper with the plastic flowers and the focal image. I wish Principal Fujiwara would come tend my veggie garden, since all my veggies are dead. His look not just healthy, but thriving. Thanks for sharing both your photos and the spread you created in your art journal with us at Art Journal Journey. A fabulous spread in your Japan journal! The origami and Japanese book papers are the perfect backdrop to that great photo! Never heard of the business card swapping tradition, that sounds fun (even though perhaps slightly pointless in some cases). Oh your journal page is really beautiful Erika and besides the lovely background (love the writing) thats such a nice photo too. What a great memory page/keepsake this one is. 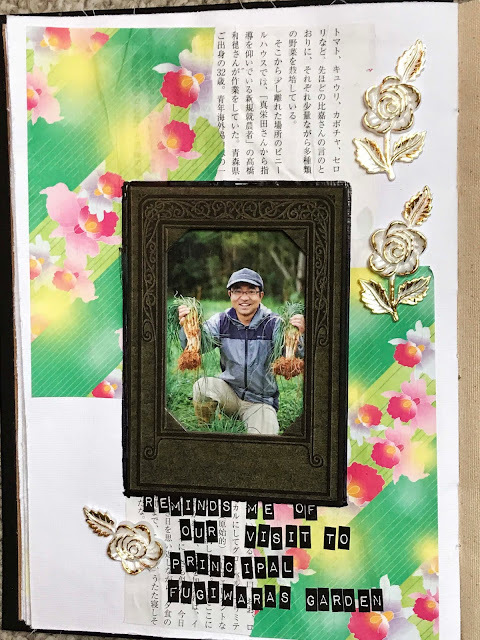 Your Japan journal will be a treasure trove of memories to look through in the future - I love how you've used all the things you found on your travels to add to the pages. Thank you for the trip to a Japanese garden too... a lovely adventure. That's an impressive garden! So large and so well-kept. The book sounds interesting, especially that it included Japan.